Some things didn't change for me, as it did for other children. I was too young to be evacuated without my mother, and she wouldn't leave Dad. He was a tram driver, but when war began, he was promoted to inspector and directed to remain in his job. So Dad went to work as usual and we stayed put in SouthWest London. There were no air raids in the first few months, but there was still plenty of excitement for an inquisitive 2-year-old. Once the sun set, it was dark - really dark! No street lights, not a glimpse of light from a window or doorway, even torches or vehicle lights had to be well shaded. On clear nights, the stars were just amazing. On Christmas Eve 1939, Mum put me and a load of parcels in the pram and set off for Gran's. It was pitch dark (London is dark at 4 p.m. in December!). She had to push the pram with one hand and keep a fold of her coat over the torch in the other. Although kerbs were supposed to be painted white during the Blackout, the painters hadn't got to our area. Several times, I was nearly tipped out, and got told off when I couldn't save all the parcels. By the time we got to Gran's, Mum was spitting chips! Cars almost disappeared from the streets because ordinary people were not allowed to buy petrol any more. Milk, bread, and coal were delivered by horse and cart. I was sent out with the coal shovel to scoop up anything the horses left behind, to manure the garden! Our window cleaner had a side bracket on his bike, to rest the ladders on, and hung his bucket from the handlebars. I remember an older cousin, who was training as a nurse, setting out for a dance one evening on her bike. She was in high heels and, lifting her long skirts, neatly draped them over the handlebars! Iron gates and railings were melted down to make guns. When the workmen came to get those in our street, Dad insisted on removing ours himself, because he said they did such a rough job. Of course, I 'helped' him! A big brick air raid shelter was built on the other side of our back fence, and one neighbor got an Anderson shelter. I had a marvelous time helping to dig the hole for it, and then covering it with the dirt we got out of the hole. We had no shelter, but Dad took out all the shrubs from our little garden and dug it over ready for vegetables. Mum (and I!) grew runner beans, potatoes, rhubarb and strawberries. Dad also built some rabbit hutches and set them up against the back fence. The rabbits, I was told, were to help out with the meat ration. Nearly everyone was in uniform of some kind. Two of my uncles were in Air Force blue, and another was a regular soldier. Dad's father was in the Home Guard, and wore his old Army uniform. He had an old rifle, and I remember Dad taking it apart one evening at Gran's, and showing me how to clean and re-assemble it. All the grown-ups seemed to have tin-hats as well as their gas-masks, and I kept asking if I could have one. But they told me I was "too little." One day Mum took me to a lovely old building which had once been our local library but was now the Food Office. It had sandbags piled around the entrance. 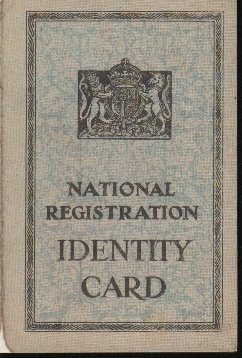 We queued for hours to get Identity Cards, and ration books. (Even me! This time no-one said I was too little.) Mum and Dad each had a beige colored one, but mine was green. That meant I was allowed extra milk. Mum wasn't cross because I wouldn't drink the milk. It meant she and Dad had fresh milk in their tea, and our custard was made with real instead of dried milk. As well as food, clothes, and fuel rationing, lots of things were in 'short supply.' They periodically disappeared, and when they re-appeared, shopkeepers kept them for regular customers, or introduced informal rationing schemes of their own. Going without jelly, icing on cake, oranges, bananas, and ice-cream, was bad enough. But just you try coping with a Dad who can't get a new razor blade or cigarettes or try to manage without being able to replace hair-grips, sewing needles or zips! Mum reckoned the famous 'siren-suit' invented by Winston Churchill failed to catch on, because, to be quick and easy to get into when the air raid sirens went, it needed a full-length zip! Barrage balloons floated overhead, and the top portion of the church steeples had been removed. Dad told me the barrage balloons were to stop dive bombers. I thought they should have left the church steeples, with their weathercocks and lightning conductors, because they would have done plenty of damage to planes. But Dad said they might burst the balloons and waste a lot of time and resources. He took me to Central London, and we watched people digging trenches in Hyde Park and Green Park, and filling sandbags. The sandbags were made into porches around the doorways of all the important buildings, and stacked up to the tops of the ground floor windows. He showed me the ack-ack gun on the tennis courts at the top of our street, and we went to all the Commons in South London inspecting searchlight batteries, more ack-ack guns, and balloon emplacements. Sometimes at night we watched searchlights and ack-ack from my bedroom window. Dad said they were just practicing, but I thought he was trying to make me believe we were safe in London, whatever Hitler tried! The colorful posters that were displayed everywhere fascinated me. So Dad started teaching me to read, and soon I could read all the posters, the newspaper headlines and the numerous leaflets distributed by the government. 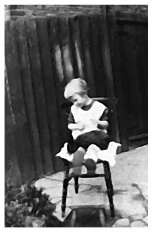 I had no brothers or sisters, or playmates of my own age, so reading became a favorite past-time. By the time I was three, I could read the Daily Mirror, Woman's Own, and Picture Post, as well as some of the books we had. I soon learned not to ask about words I didn't understand, in case Mum decided I was reading something unsuitable. I looked them up in the dictionary instead. Dad said I was too young to really take in much of what I was reading. He thought I was 'just looking at the pictures.' He had obviously forgotten how graphic the pictures in the 'Home Doctor,' the First Aid Book and Civil Defense manuals were! In this way, and by staying quiet and pretending to be occupied when grown-ups were talking, and by watching the newsreels from under my eyelids at the pictures when they thought I was asleep on Mum's lap, I got a pretty good idea of what was happening. To begin with, it was more interesting and exciting than frightening. But then I heard Dad telling Mum what had happened to my Uncle at Dunkirk.